Here you will find a wide array of guides and toolkits developed by Meal Exchange, and links to additional resources developed by our friends from across North America -- Check it all out! National Student Food Charter: This charter was created by post-secondary students from across Canada to guide their work.The values expressed within help provide guidance and a compass for the student food movement. MX Chapter Programming Guide: You’re involved because you want help create sustainable food systems and alleviate hunger . Before you start to act, take a moment to learn about Meal Exchange's programs! MX Campus Fundraising Guide: Most great and innovative ideas to tackle flaws within the food system need a little capital to help get them going. This guide can help. Chapter Executive Positions: These position descriptions were created nationally by Meal Exchange as suggestions to help you define responsibilities within your chapter executive. Chapter Transition Checklist: The Transition process is very important and will directly affect the level of success that your chapter will reach during the year. This checklist can help. Interview Resources: If you have more than one student interested in a position, you may consider conducting interviews. Here are some helpful interview questions prepared by Meal Exchange. Chapter Constitution Template: This template will help you create your chapters constitution. A constitution is a central part of your group’s operation. It outlines your group’s mandate, membership rights, transparency, accountability and democratic principles. Communicating with the Chapter Network and MX National: The success of each chapter lies in their ability to utilize the resources that Meal Exchange provides, this includes connecting to the Meal Exchange Chapter network. Campus Budget Guide: In order to be fiscally responsible your chapter needs to have a plan on how money will be spent. Understanding the Pillars of Food Security: You’re involved because you want help create sustainable food systems and alleviate hunger . Before you start to act, take a moment to learn about the issues so the work you do will have the maximum impact. Set Chapter Goals and Identify Assets: The process of goal setting will help bring your membership together and orient your future activities. This guide can help. Food Service Overview Toolkit: This toolkit provides you with the information and support to set up a first meeting with your food service provider, administration or chefs. Purchasing Baseline Toolkit: This toolkit, helps you understand how big food service providers and distributors work. It will provide you with ideas & processes for how you can work together. Supply Chain Assessment Toolkit: The goal of this toolkit is to help you figure out what local and sustainable food is available in your region, what of it your university could be buying, and what’s missing to make this happen. Student Food Insecurity Research Toolkit: This comprehensive guide outlines all the steps to designing a research project to study student food insecurity on your campus! 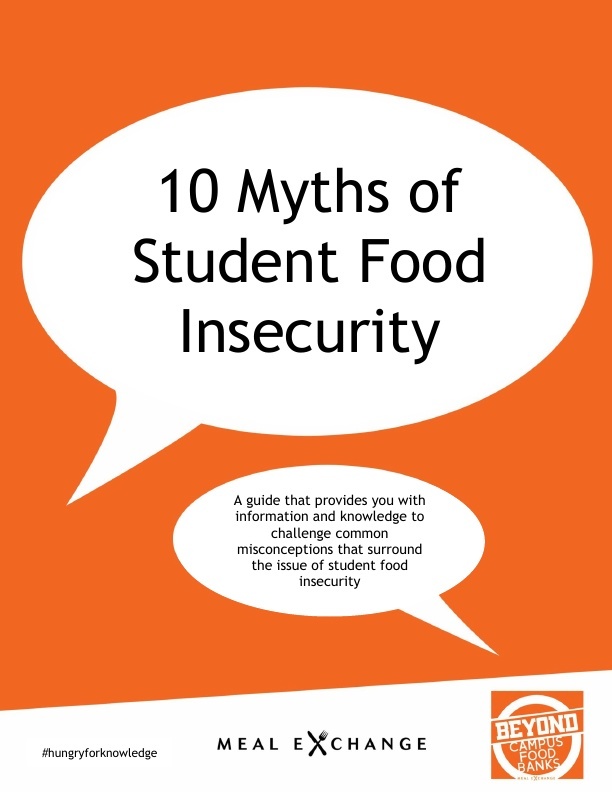 10 Myths of Student Food Insecurity: There are many common myths about student vulnerability to food insecurity. Learn how to respond to these with this guide! Student Food Insecurity Advocacy Toolkit: Want to raise awareness of student food insecurity on your campus? Check out some of our innovative advocacy event ideas. 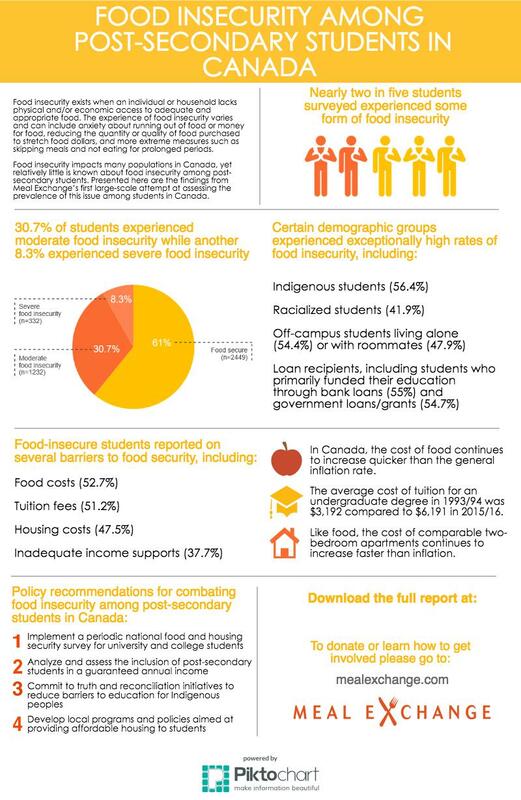 Food Insecurity Among Post-Secondary Students In Canada: An infographic detailing our student food insecurity research from the Hungry for Knowledge Report. Campus Hunger Report Toolkit: Learn how to collect data from campus food bank visitors to learn more about student food insecurity on your campus. Who Does Post-Secondary Student Food Insecurity Impact? 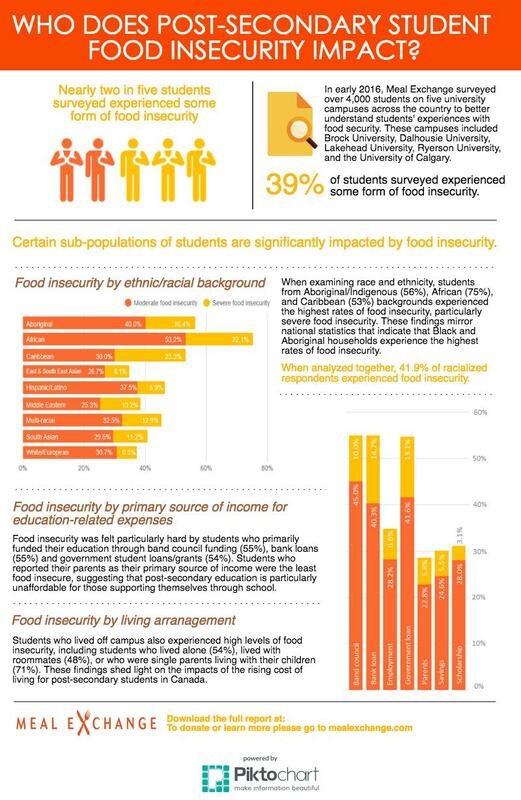 : An infographic about the impact of student food insecurity from our Hungry for Knowledge Report. Applied Student Research Toolkit: This toolkit provide you with examples and inspiration for how you can bring the academic and operational sides of your campus together. Multi-Stakeholder Toolkit: This toolkit provides direction for the development of a strong food system group on campus.It will help you realize who you can connect to create a diverse and knowledge working group. Applied Learning Partnership Protocol: The document outlines Meal Exchange's protocol for interacting with any mentor who plays an advisory or supportive role in your applied learning experience associated with Meal Exchange.